One of the key premises that I have with regard to interests rates staying low for a very long time relates to demographics. The United States is projected to grow more slowly in the future and as a result the labor force growth will also slow which will make the productive capacity of the country lower than it otherwise would be absent material gains in productivity. Slower GDP growth should lower returns in the economy and keep interest rates low. That’s the simple explanation. A recent research piece came out from the Bank for International Settlements that makes the case as to how my premise could be wrong. The authors assert that lower interest rates and inflation have not been coming from slowing labor force growth, which has been occurring for 40+ years, but due to the integration of the huge labor forces of China and Eastern Europe into the global economy. Absent this labor supply shock, they contend that inflation and interest rates would be higher. The slowing trend, particularly in the advanced economies, is evident by the following chart shows. China’s labor force joined the global economy but its capital/labor ratio was much lower than global standards. They estimate that this represented a one-time increase of 120% in the global workforce available for production. 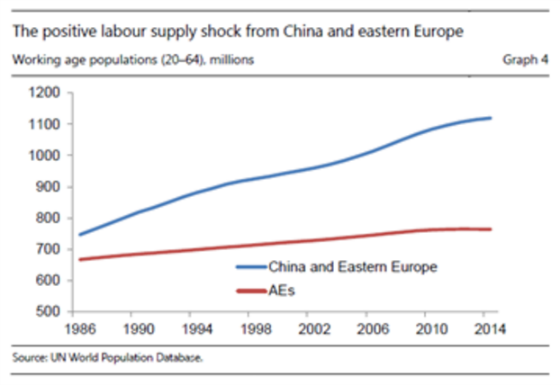 The following chart shows the absolute numbers in the working age populations for China and Eastern Europe and the advanced economies. China’s financial system was in many ways a closed system, allowing capital in but making it difficult to get out. Low real domestic interest rates in China drove capital accumulation. Monetary policy was loose to allow for maximum internal growth and attracting a large amount of global capital. There was a huge demand for savings from the corporate/state-owned enterprises and the household sector, which feared the loss of the social safety net due to the one child policy. This savings glut was channeled back into the U.S. Treasury bond market with lowered real interest rates. There is a lot there in those bullet points but essentially the authors were trying to identify the main reasons as to why global savings have grown more rapidly than investment . The authors contend that this will reverse as China and most of the developed world faces a shrinking labor force. 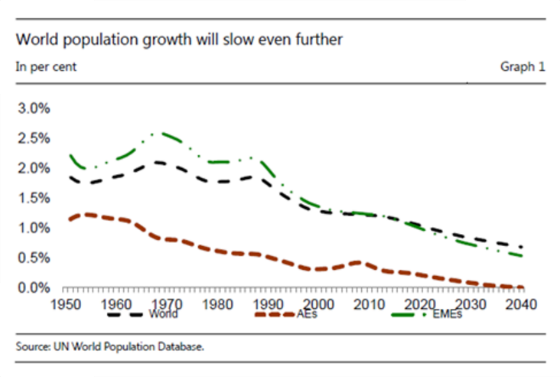 India is one notable exception bucking the demographic trend. With a shrinking pool of workers in some countries and slower growth in others, the authors believe wage pressures will materialize because as societies get older, the demand for medical services will rise and age-related medical conditions rely on labor far more intensively. This is definitely the case today but my question is whether robots or other labor saving technologies will materialize to help slow the demand for labor in this part of economy. 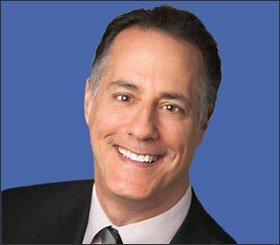 There will be an economic incentive to substitute capital and technology for labor but the jury is out as to how effectively this can be done in such a service-centric sector. The authors acknowledge that demographics will lower potential output growth but, unlike many others (such as myself), they don’t think it will lower interest rates. They think they will rise because they believe that aging “will lower both desired savings and desired investment, but desired savings will fall by more.” The following is a chart of income and expenditures by age group in the United States that has influenced me greatly over the years. 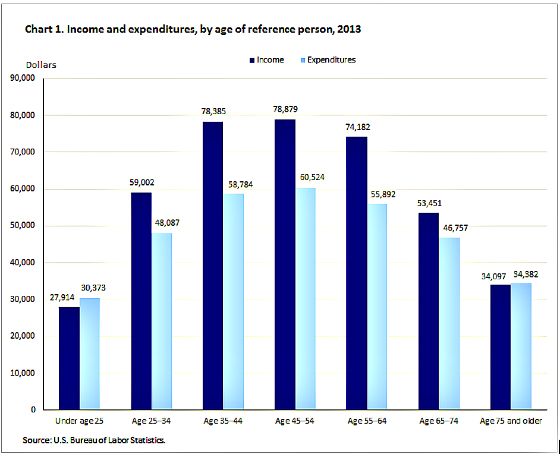 Clearly income and expenditures both drop as people age. 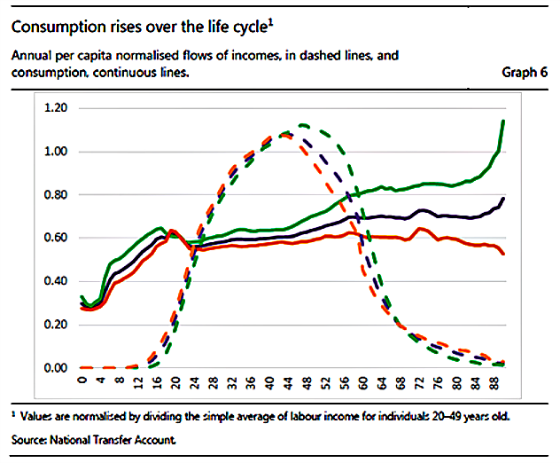 This chart has been very influential in terms of my thinking about interest rates. And yes, while it appears savings does drop, but so do expenditures. Thus, my working hypothesis is that potential growth will be slowing and this will keep interest rates low. Suddenly though the authors reference a chart that has me scratching my head as it shows the opposite trend when measured on a per capita basis. The chart is scaled based on the ratio of spending to the average expenditures of 20-49 year olds. Research teams in more than 60 countries are constructing accounts that measure how people at each age produce, consume, and share resources, and save for the future. These accounts are designed to complement the UN System of National Accounts, population data, and other important economic and demographic indicators. I will have to dive more deeply into this chart and the methodology behind it. I think what it takes into consideration that the chart above it does not is public expenditures allocable to each age group. I must admit that I didn’t really integrate this into my thinking like I should have. In other words, maybe consumption will not drop as much as I had initially thought given the transfer payments to those receiving medicare and medicaid benefits. On the other hand, Fidelity just came out with a report estimating how much retirees will have to spend for medical costs and they project an average of $275,000 per couple for those who have medicare coverage but excludes the cost of long-term care like nursing homes. This is up $15,000 from last year’s estimate. So maybe I have been underestimating future expenditures in the country by excluding government spending on behalf of older people, but the authors believe that the social safety net will be strong enough for people to not need to save as much as they age. If Fidelity’s estimates are anywhere near accurate then I think the authors are going to be off the mark. For those outside the top 5% to 10% of the country in terms of wealth accumulation, I see more of an emphasis on savings, despite the social safety nets of social security and medicare, versus less. Maybe I’m seeing what I want to see and the data suggests something different. And maybe the government will fill the void but I think most people question whether there will be enough of a safety net for them in the future to change their savings behavior. Now those are some big assumptions to be making. People don’t move as much into their children’s homes now as they used to but they do move into retirement communities, assisted living facilities, nursing homes, or apartments and condos to downsize. There are more lifestyle options now and eventually health issues force a move. It’s oftentimes easier said than done in difficult to build locations to say that younger people will shun purchasing older people’s homes because they don’t meet their tastes or have the contemporary design and creature comforts. It’s just not easy to build new housing no matter how much they may want it. I see a lot of remodeling and tear downs going on in many places that I visit so I think that is an off the mark assumption, especially if homes are in desirable and growing areas. They can always lower the price to clear the market, tear them down, or remodel them to meet their tastes and needs. If they are in less desirable and shrinking areas then that is a different story. I’m not sold on this key assumption of theirs. The authors make the reasonable case that in a tighter labor environment there will be more of an incentive to invest in productivity-enhancing equipment and technology which should boost investment. They do believe, on the other hand, that capital goods will be faced with continuous pricing pressures which will result in the dollar volume of investment growing more slowly than it otherwise would. I’m sorry, but if only 6.5% of the disinflation is attributable to the age structure over 40+ years, then I would not put a lot of stock in this variable from an explanatory standpoint. Too many other forces are at work. I am personally not convinced at this point by the authors’ contentions that investment will exceed savings in the years ahead and push inflation and interest rates higher. I can’t help but looking at Japan as the canary in the coal mine as it has been contending with very challenging demographics for the past 15 years or so and short-term interest rates having been below 1% since 1995. 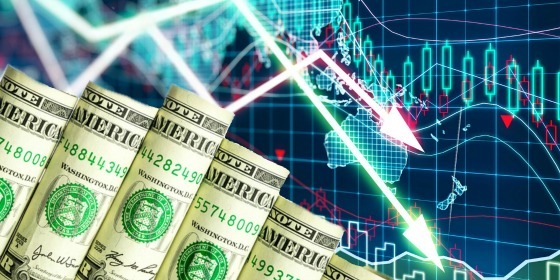 The author contends that over-investment and over-indebtedness have been more powerful forces than demographics and if those get worked through then the demographic forces will lead to deflation going away and interest rates rising. Perhaps the over-investment and over-indebtedness came about due to the aging society increasing its desire for savings and led to the over-investment and over-indebtedness. Fortunately, the authors allowed others to critique their analysis or provide their own thoughts and questions based on the research paper. One of the invited writers was Masaaki Shirakawa who was Governor of the Bank of Japan from 2008-13. He wrote a very interesting companion piece and what I think was a much more accurate reflection of reality and what we can learn from Japan’s experience and extrapolated to other advanced economies with aging societies. I will address this next week.